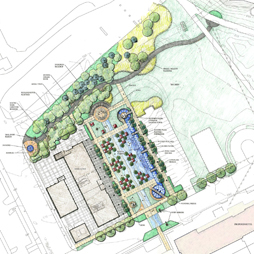 Moline Bass Street Landing master plan and plaza design | Vandewalle & Associates, Inc.
As a centerpiece to development, a new urban plaza, park, and bike pathway project was designed schematically by Vandewalle & Associates. Working with Shive Hattery, a local engineering firm, this exciting plaza and performance venue was detailed to compliment a variety of new business, hotel, and residential users bordering the space.The City of Moline aimed to stimulate renewed activity downtown. As part of a 20-year planning relationship with the City, Vandewalle & Associates recommended the redevelopment of the City’s waterfront district. Working with Renew Moline, a development agency created by John Deere and Company, Vandewalle & Associates assumed an active role in planning, urban design, and developer recruitment & negotiations for this emerging Riverfront Renaissance district.